Dr. Nae’el Lacham, a Palestinian resident at the Hadassah Medical Center, sometimes receives requests for a consultation from hospitals in his hometown of Hebron. One evening this summer he examined an infant and concluded that her only chance for survival was to be taken to Hadassah. Dr. Lacham presented the case to his colleagues at Hadassah during the daily meeting of the Pediatric Cardiology Department, headed by Prof. Azaria Rein. 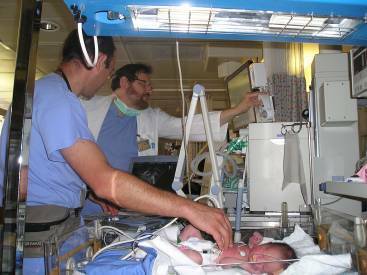 It was decided, without hesitation, that the baby should be brought to Hadassah. Prof. Rein made sure there was a bed for her in the pediatric intensive care unit and that the hospital management approved. Hadassah’s team of health professionals consulted with the hospital in Hebron, the Red Crescent Society which would provide the ambulance to take the baby from Hebron to Israel, the Israeli ICU ambulance company which would meet the Palestinian ambulance half way and bring the baby to Hadassah, and the Israeli Civil Administration Authorities to get the father an entry permit to Israel. Within two hours the baby was at Hadassah! First she received an ultrasound test to see if she could undergo catheterization. When it was determined she could, a catheterization procedure was arranged.